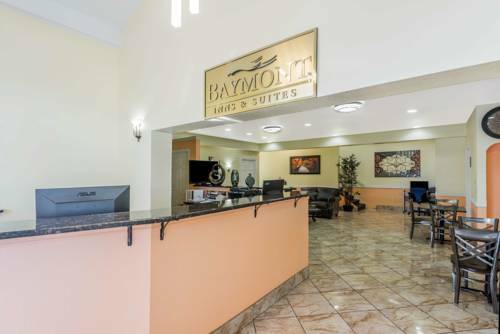 You'll receive a warm southern welcome at this Baymont Inn and Suites San Antonio Near South Texas Medical Center, just off Interstate 10 and Interstate 410, a short drive from San Antonio International Airport and close to Lackland Air Force Base, Riverwalk, Six Flags Fiesta Texas, Brackenridge Park and Zoo and the University of Texas at San Antonio. This lodging facility features complimentary wireless Internet and complimentary breakfast, as well as an outdoor pool, dry-cleaning, and a business center with complimentary wireless Internet and fax service. Rooms feature spacious work desk and iron and ironing board, perfect for business travelers. Parking is complimentary for trucks and buses, and there is no charge for kids 17 and under when accompanied by an adult.